Aton Drills 36M @ 12.47 g/t Gold in First Drill Holes at Rodruin, From 5m Depth | Aton Resources Inc.
Vancouver, October 1, 2018: Aton Resources Inc. (AAN: TSX-V) (“Aton” or the “Company”) is pleased to update investors with the results of the first 3 drill holes from the reverse circulation percussion (“RC”) drilling programme at the Rodruin prospect within the Company’s 100% owned Abu Marawat Concession (“Abu Marawat” or the “Concession”), located in the Eastern Desert of Egypt. Drill hole ROP-001 has returned mineralised intersections of 13m @ 1.02 g/t Au from 10m depth, and 5m @ 2.97 g/t Au from 50m depth. have been completed to date, ROP-001 to ROP-011. Aton has contracted Capital Drilling to undertake the RC drilling using a track-mounted Gemrok MP-1000 multi-purpose rig, which is capable of both RC and diamond drilling (see Figure 1), operating with a large, truck-mounted 500psi/1300cfm compressor. The first phase of drilling is planned to consist of approximately 4,000 to 6,000 metres of RC drilling, initially testing the main zone of ancient workings and mapped mineralisation in the Aladdin’s Hill area, before moving on to other mineralised areas. Drilling commenced at Aladdin’s Hill at the western end of the Rodruin prospect (see Figure 2). Surface rock chip sampling on a 5m x 5m grid over the highly altered host rock and ancient workings at Aladdin’s Hill has recently returned an average grade at surface of 3.75 g/t Au, with individual samples grading up to 18.75 g/t Au (see news release dated September 4, 2018), and underground sampling at Aladdin’s Hill has returned high grade samples to depths of c. 40m below ground level, grading up to 15.45 g/t Au (see news release dated April 16, 2018). Surface channel sampling around Aladdin’s Hill (see Figure 2) has recently returned significant and wide mineralised intersections including 62.6m @ 2.34 g/t Au and 1.49% Zn (profile ROC-003), 64.9m @ 2.29 g/t Au (profile ROC-005), and 65.3m @ 2.84 g/t Au and 5.26% Zn (profile ROC-009), see news releases dated September 12, 2018 and September 24, 2018. Abundant visible gold in highly altered rocks has also been identified in outcrop at Aladdin’s Hill. Drill holes were drilled at c. 140mm diameter, and the bulk percussion chip samples were collected directly into large plastic bags from the cyclone every metre, numbered with the hole number and hole depths by the drill crew, and laid out sequentially at the drill site (see Figure 1). RC chips were logged onsite by a senior Aton geologist. The bulk 1m samples were weighed, and subsequently riffle split through a 3-tier splitter onsite by Aton field staff to produce an approximately 1/8 split, which was collected in cloth bags, numbered and tagged with the hole number and depth. The reject material from this initial bulk split was re-bagged, labelled and tagged, and the bulk reject samples will be stored and retained on site at Rodruin. All the 1m split samples were weighed again, and the samples selected for assay were riffle split onsite, typically a further 3-4 times using a smaller lab splitter, to produce a nominal c. 250-500g sample split for dispatch to the assay laboratory. All samples were sent for assay from holes ROP-001 to ROP-003. The laboratory splits were allocated new sample numbers. QAQC samples were inserted into the sample runs dispatched to the assay laboratory at a nominal rate of 1 duplicate sample for every 10 drill samples, 1 blank sample every 10 samples, and 1 standard sample of a certified reference material every 40 samples. Reject material from the 1m samples after the laboratory split had been taken, and any unused 1m splits will be retained at the Company’s Hamama laboratory for future reference purposes, as and when required. The selected c. 250-500g split samples were shipped to ALS Minerals at Rosia Montana, Romania for analysis. Samples were analysed for gold by fire assay with an atomic absorption spectroscopy (“AAS”) finish (analytical code Au-AA23); and silver, copper, lead and zinc with an aqua regia digest followed by an AAS finish (analytical code AA45). High grade gold samples (>10 g/t Au) were re-analysed using analytical code Au-AA25 (also fire assay with an AAS finish); and Au-GRA21 (fire assay with a gravimetric finish) for samples which returned gold grades >100 g/t, when required. High grade Ag and base metal samples (Ag >100 g/t, and Cu, Pb, and Zn >10,000ppm or >1%) were re-analysed using the ore grade technique AA46 (also an aqua regia digest followed by an AAS finish). Hill to test the zone of highly altered rocks with associated underground workings (see Figure 3). Details of the collar locations are provided in Table 1. 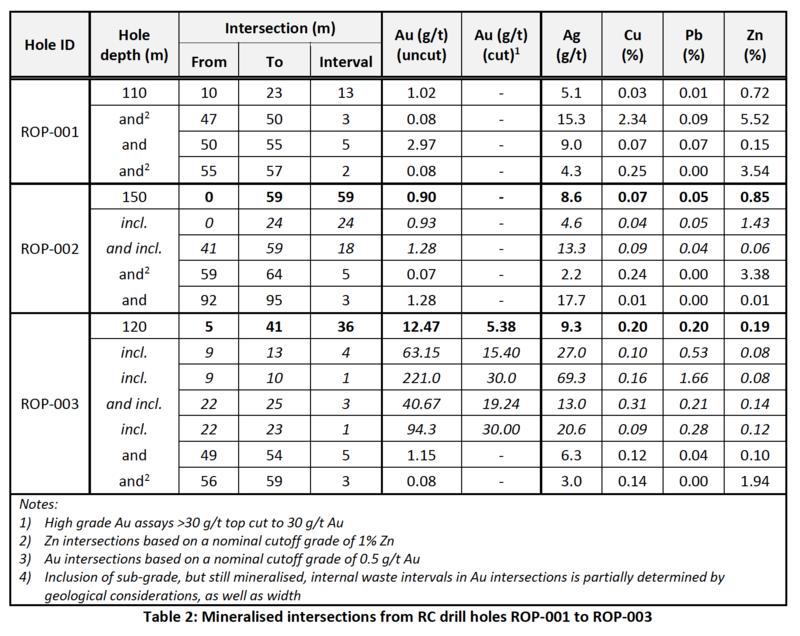 Significant gold mineralisation was intersected in all 3 holes, and details of the mineralised intersections are provided below in Table 2. The first holes drilled at Rodruin all tested mineralisation and ancient workings in the immediate Aladdin’s Hill area, with the first 3 holes all intersecting significant Au(-Zn-Ag-Cu-Pb) mineralisation. Narrow ancient underground workings and stopes, less than 1m in width, were intersected in all 3 holes at depth, and ROP-001 was apparently collared in a larger infilled working intersected from surface (see Table 1). Holes ROP-002 and ROP-003 were collared from the same location with both intersecting wide downhole intersections of mineralisation, predominantly hosted by a pink to brown, strongly phyllic altered granular quartz-mica-iron oxide rock, believed to be after meta-sediments or greywackes. Mineralisation is distributed throughout the bulk of the intensely phyllic altered host rock. Structurally controlled higher grade zones are localised within this highly altered rock, and are often enriched in copper. These zones have been partially exploited by the ancient miners, including the large “Aladdin’s Slot” stope which has been followed and sampled underground to a depth of c.40m below ground level, and over an E-W strike length of at least 40m (see news release dated April 16, 2018). Mineralisation within the altered rocks consists of a complex assemblage of native gold, occasionally very coarse with grains up to 2mm in size, associated with zinc, copper, lead and arsenic supergene minerals. The transition to fresh rock in the drill holes is quite deep, and is strongly suggestive of preferential weathering down sulphide-rich mineralisation. A second, different style of predominantly Au-Zn mineralisation is associated with gossanous carbonates and slates, notably close to lithological contacts between these two rock types. Drill hole ROP-001 intersected gossanous carbonate-hosted Au-Zn mineralisation near surface (13m @ 1.02 g/t Au, see Table 2) and what is believed to be an extension of the high grade Aladdin’s Slot underground workings into the carbonate unit, at approximately 50m down hole (5m @ 2.97 g/t Au). 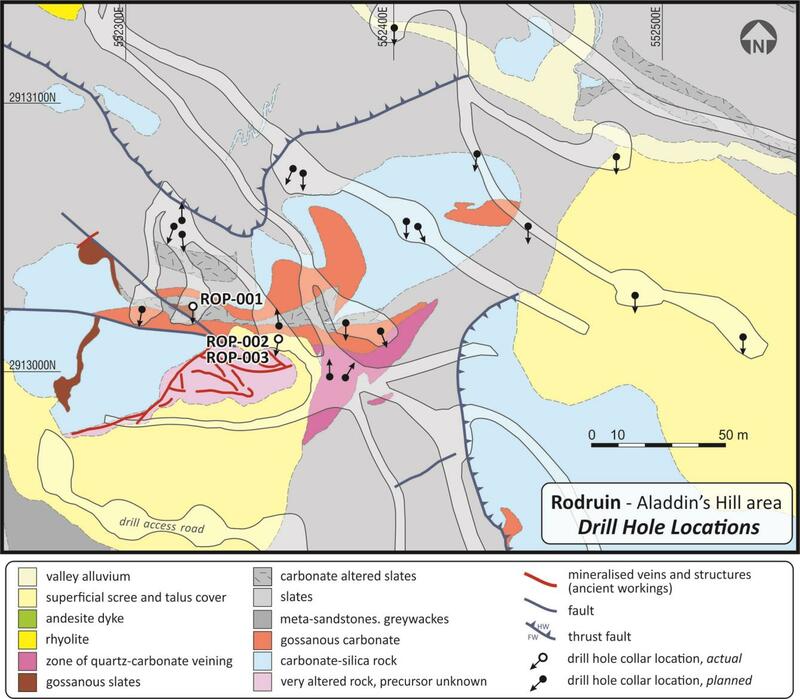 Drill holes ROP-002 and ROP-003 both intersected broad downhole zones of mineralisation (see Table 2) associated with the highly altered rock hosting the main zone of underground workings at Aladdin’s Hill. True mineralised widths cannot be ascertained at this early stage of drilling. The high grade overall intersection in ROP-003 (36m @ 12.47 g/t Au) includes 2 very high grade zones (4m @ 63.15 g/t Au and 3m @ 40.67 g/t Au), one of which was associated with a narrow underground stope. 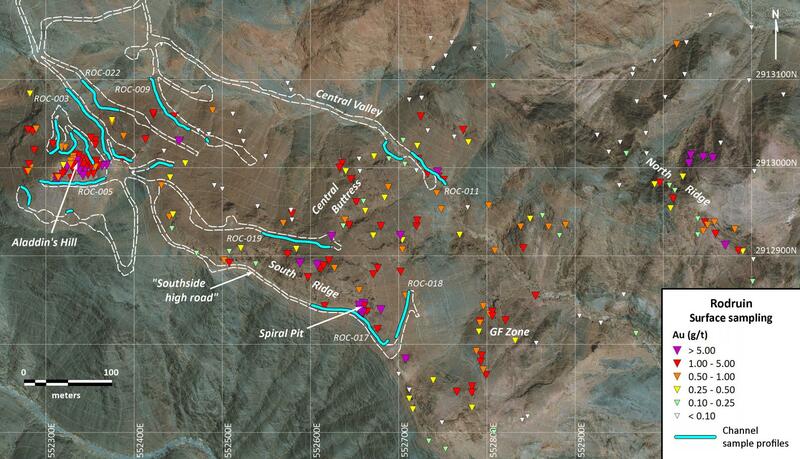 These very high grade assays and zones are believed to be representative of the mineralisation present at Aladdin’s Hill, which was the main target of the ancient miners in this immediate area, as evidenced by the coincidence of the second very high grade zone with a narrow ancient stope. to develop as many additional areas away from Aladdin’s Hill as practically possible for drill testing during the ongoing initial Phase 1 RC drilling programme, including the Spiral Pit, as well as gossanous mineralisation on the Central Buttress and at the GF Zone (see Figure 2). Construction of drill access roads and pads is ongoing at Rodruin to support the current Phase 1 RC drilling programme, with roads being constructed and in places widened to allow access to mineralisation close to the Spiral Pit, as well as high on the Central Buttress of the South Ridge and the GF Zone at the eastern end of the South Ridge (see Figure 2). 3 excavators are currently working onsite to maximise the amount of drill positions available during the Phase 1 RC drilling programme. Channel sampling of mineralisation exposed in access roads is ongoing (see Figure 2), with new profiles sampling mineralisation exposed near the Spiral Pit (ROC-018), high on the Central Buttress (ROC-019), and on the intermediate drill access road between profiles ROC-003 and ROC-009 (ROC-022, currently in progress). Further samples have been dispatched from site, and assay results will continue to be released when they become available. workings in the Aladdin’s Hill area has also been sampled to a depth of approximately 40m below ground level, indicating continuation of the surface mineralisation at depth (see news releases dated February 6, 2018, March 5, 2018 and April 16, 2018), and drilling has now confirmed the presence of high grade gold mineralisation with individual samples returning assays of up to 221 g/t Au over metre intervals. Underground workings at the Spiral Pit have been sampled to a depth of 12-15m below ground level, returning assays of up to 35.3 g/t Au and 37.9% Zn (see news release dated August 7, 2018).